Motion activated wireless LED light bar for home, office or workshop. Light head swivels 60 degrees. 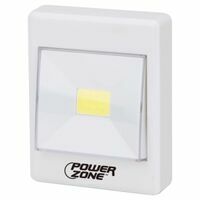 Built-in motion sensor, light will turn on when motion is detected and will turn off automatically when no motion is detected after either 30 or 60 seconds. Includes screw mount bracket and screws for easy installation. On/off switch. 150 lumens. Runs on 6 AA batteries (not included). 11.75" L x 2.5" W x 1" D.
RF technology works through walls. Up to 20 lights can be linked to the same remote control switch. 125 lumens. Switch uses 2 AA batteries (not included), light uses 3 C batteries (not included). Features a variable dimmer and an automatic battery-saving shutoff. Operates using radio frequency. Four LED heads swivel and pivot. 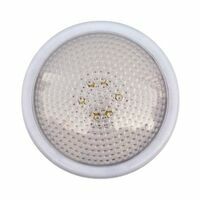 85 lumens, 4000 Kelvin (warm white). Battery life approx. 55-60 hours. Battery standby life approx. 12 months. Can be installed as part of a set. Detaches from its bracket for handheld use. Light heads pivot 90 degrees and swivel 180 degrees. 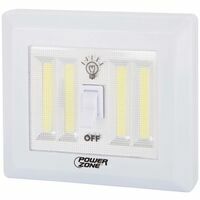 Wireless 433 MHz switch turns lights on and off up to 60 feet away. Variable dimmer. 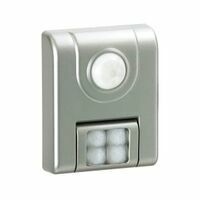 Controls up to 20 wireless remote control lights with one switch. Uses 6 AA batteries, not included and 2 AAA batteries for remote, not included. Includes double-stick tape, screws and drywall anchors. 0.8 lb., 17.5"L x 3"D x 5.25"W.
Turns on with a tap and gives off 30 lumens of warm white illumination. Works on a tabletop or mounted on a wall. Powered by 3 AA batteries (not included) and has a run time of 40 hours.